Next Generation Ministries: What A Team! Melody with one of her "kids"
This young lady ... right here ... has added SO much to TEAM NGM. Out of a field of seven candidates, Melody was chosen unanimously by the Uganda Board of Directors to coordinate the educational sponsorship program of Next Generation Ministries. Melody has completed her first year of employment and considers her first year of service a crash course in education in it's own right. Melody is 26 years old, single ... and content with that current status ... and has made her family from the nearly 40 sponsored students she loves with her life. Not only does she make sure that their school fees are paid, but she continually communicates with the student's sponsors. With a sensitive spirit in regards to the whole needs of her children, Melody is loved by the children and respected by their sponsors. It is a pleasure to welcome Melody to the NGM keyboard as she bangs out a brief story featuring one of her high school student who is hopes to graduate this year. Hopelessness defined her life. It was not always this way. During her primary school years, she was just like any of her classmates. She was attending school and the future was bright. As Shakira entered secondary school, she still had hope. However, as she advanced to higher levels of education, the financial requirements increased as well. Shakira had a faithful sponsor, but she was on a limited income. The sponsor was unable to increase her donation in order to keep pace with the increased education expenses. For lack of finances to sustain her in boarding school, Shakira decided to join the day section and travel daily to school by public means. Attending school was possible for Shakira whenever her mother had money for transport. The days she had no money, Shakira accompanied her mother to the garden. Shakira was not able to do her exams because of the tuition debt she owed the school. A home intervention was made in January this year. The NGM staff visited Shakira’s parents to tailor a way forward. From the interaction with Shakira’s parents, we understood that not only did Shakira’s father lack interest in her education, he was also financially challenged. He moves from one place to another looking for work. “He sometimes comes home with nothing. Not even a shilling to buy sugar or soap. 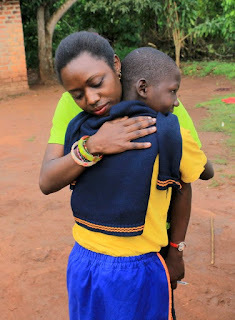 We are financially challenged and I don’t know how to see Shakira and her siblings through school.” Shakira’s mother informed the NGM sponsorship coordinator. Shakira is uncertain about her future. Her education is at the edge and her mother has given up. NGM sponsorship is not willing to drop Shakira. She is in her final year of secondary level and needs money for tuition and school expenses. One school term is a period of 3 and half months. Tuition fees and school expenses cost $ 363 per term. Would you like to stand with stand with Shakira? Would you like to make a donation of $20, $50 $100 a month or the whole $363 per term? Would you share this cause with someone you know could contribute to Shakira’s education? Would you stand with Shakira as a group of friends or as a family? You may choose to make a donation and send it to: NGM, 29940 S. Dhooghe Rd. Colton, OR 97017 and please include the name Shakira in the memo.